Since the end of the Cold War there have been a number of cases where the democratization process has been turbulent, or even violent. 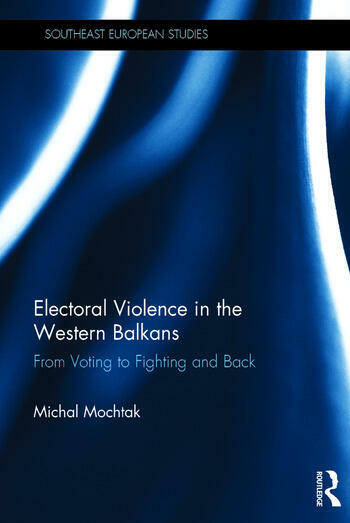 Addressing electoral violence, its evolution and impact in the Western Balkans, this book explores the conflict logic of election and tries to understand its basic patterns. Two decades of electoral competition in the region are analysed to identify an interesting evolution of electoral violence in terms of forms, actors, motivations and dynamics. By identifying the potential drivers of electoral violence and explaining the escalation and stimulus of violence-related events, the author combines a theoretical approach with original data to emphasise the variability of the phenomenon and its evolution in the region. The book will appeal to students and scholars of post-communist Europe and democratisation processes and the Western Balkans in particular. It should also be of interest to political advisors and those involved in developing or implementing democratisation programmes. Dr Michal Mochtak is a Research Fellow at the International Institute of Political Science, Masaryk University. His research interests cover hybrid regimes, electoral violence and conflicts. He published his papers in Terrorism and Political Violence, Journal of Southeast European and Black Sea Studies, Democracy and Security or World Political Science. He is one of the co-authors of the publications Challenges to Democracies in East Central Europe (London, New York: Routledge 2016) and Demokratizace a lidská práva. Stredoevropské pohledy (Brno - Praha: MUNI Press – SLON 2013 and Krakow – Brno: Osrodek Mysli Politycznej – Uniwersytet Masaryka 2016). He regularly lectures on transformation processes and political violence in Central and Eastern Europe. See more www.mochtak.com.